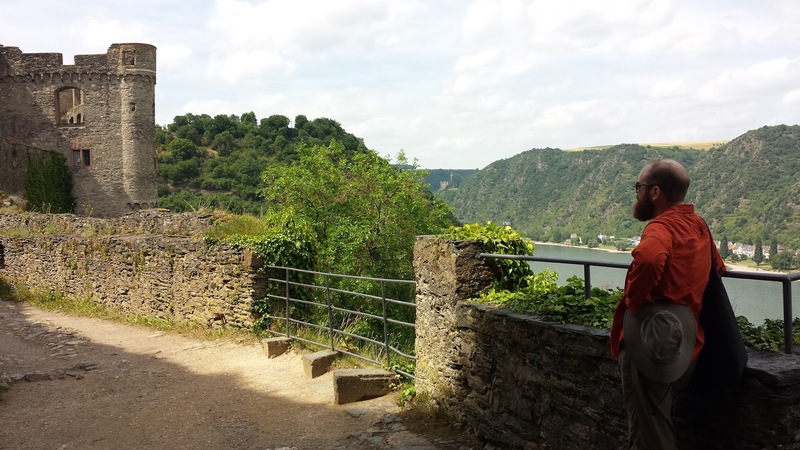 I just got back from Germany - 10 days hiking up the Rhine valley and then a short stay in Berlin. It was a fantastic trip, and one that transformed the way I look at war-gaming and especially Warhammer. In the weeks prior to my departure, I was playing a lot of the computer game Mordheim City of the Damned. Without hesitation, I'd say it's the best implementation of a miniature skirmish game into a digital format. It certainly captures the flavour of the Old World, especially the distinctive architecture of the Empire. The houses are all tall, half-timbered constructions bulging over the street, turrets sprout from even humble dwellings and ground floors are often completely open so as to allow free passage to the rear of the house. 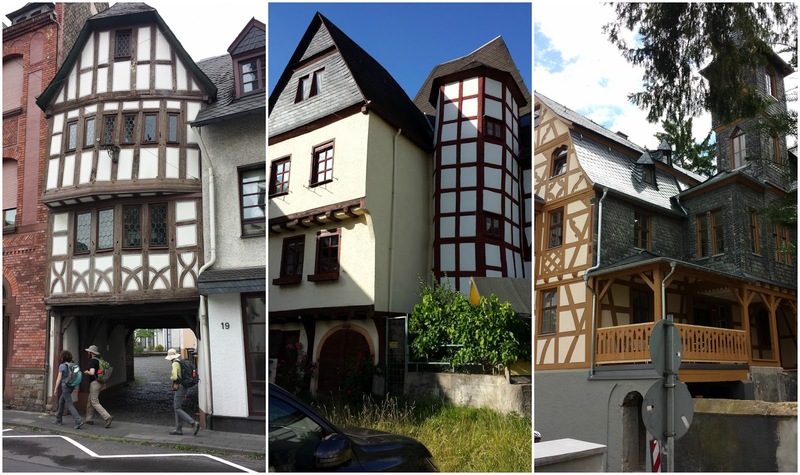 This architectural extravagance is part of a long tradition, stretching back to the early days of the Warhammer Townscape, carried on by countless homebrew projects, and brought to new heights in today's market by companies like 4Ground. Being from North America, I always thought these flights of fancy were a tacky caricature of German architecture. But... it's true. It's all true. Town after town in the Middle Rhine is crammed with half-timber buildings from the 17th and 18th centuries: inns, townhouses, convents, convents converted to inns, watch-towers and rambling mansions. Above you can see just a few examples of the specimens I found. It just goes to show that sometimes reality can exceed fantasy. We started in Mainz, and walked west and north into the towns of Rudesheim, Bingen, Lorch, Kaub, St. Goar, Braubach and then ending in Koblenz. This stretch of the Rhine is a UNESCO World Heritage site, and no one can accuse the Germans of skimping in the castle department. Towers, fortification and fortresses overlook every curve in the river, ensuring that back in the day every Rheinish princeling got a taste from the merchants trading up and down the waterway. Most of the Middle Rhine's castles are intact and open to visitors. Some even contain hotels, restaurants and spas. 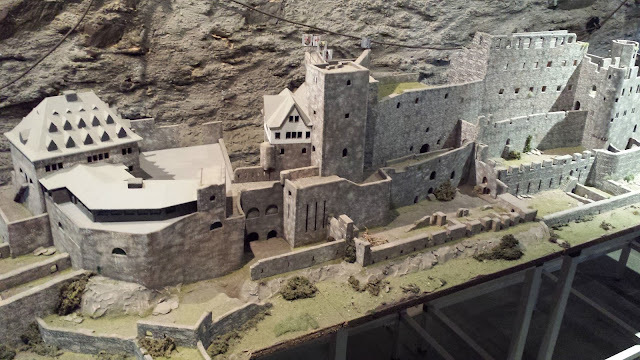 The most impressive is Marksburg Castle above Braubach, where painstaking efforts have been made to restore the medieval interior. 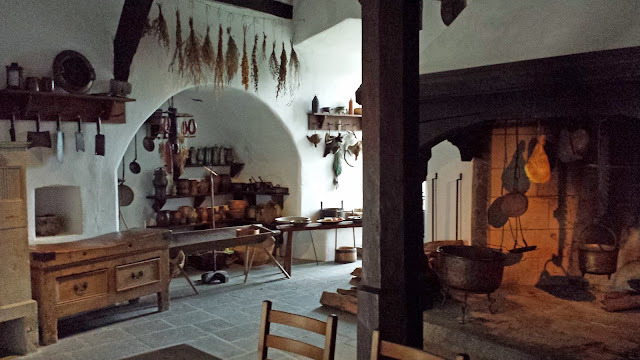 It even smelled like a castle: a yeasty mix of old leather and damp wood, not unlike the barrel cellar beneath a winery. I was particularly impressed by their recreation of a historically accurate herb garden, including "plants of witchcraft, magic and superstition". 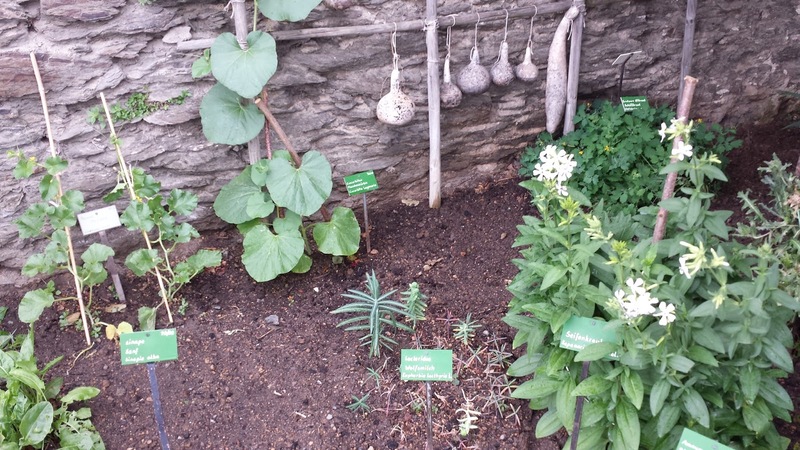 Who knew that there's actually a plant called Trollblume? The most delightful surprise of the trip came when our landlord in Lorch pointed out that we were hiking through the former territory of one of Europe's oddest microstates, the Freistaat Flaschenhals, which translates as the "Free State of Bottleneck". 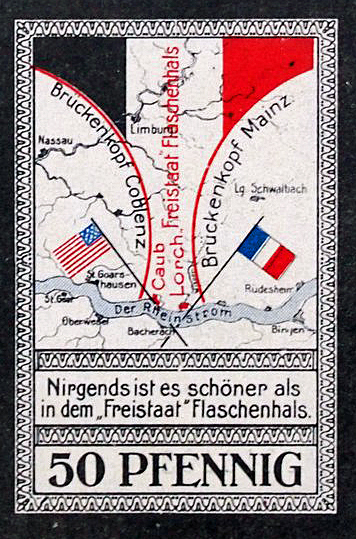 After World War I, the Allied Powers established strict occupation zones in Germany. They divided their responsibilities by drawing compass circles on a map of the Rhine region. 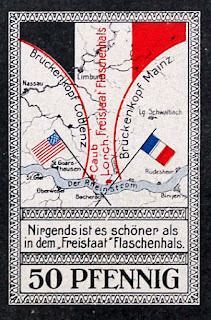 However, the circles for the USA and for France did not quite meet, leaving a bottleneck shaped area that was at once left to its own devices and cut off from the rest of Germany by militarized borders. The main villages in this area, Lorch and Kaub, declared independence in January 1919. 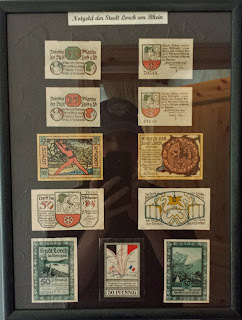 They printed their own money and stamps (of which my Landlord had a beautiful collection). 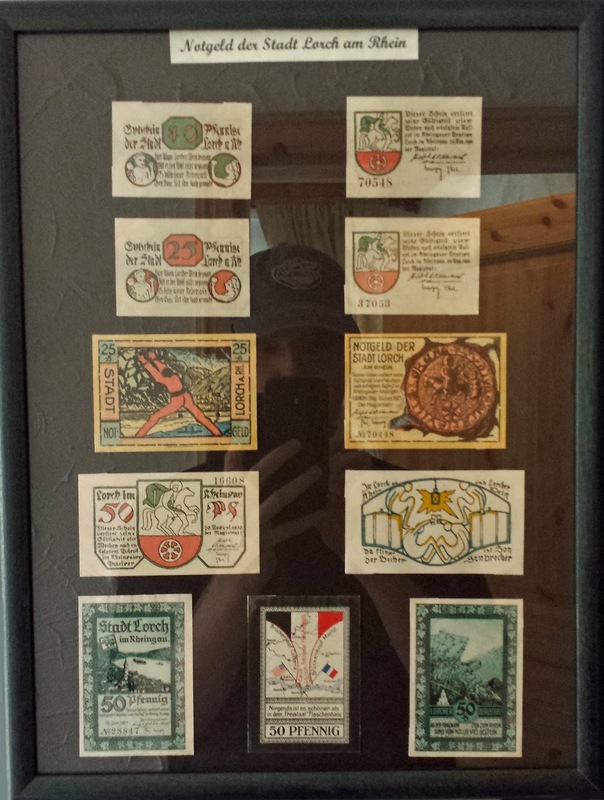 In fact, their 50 Pfenning note features a map with the two sweeping compass circles brought their country into existence. The Free State of Bottleneck seems like a wonderful playground for interwar wargaming. It has certain highly romantic elements. For instance, it was not permissible to trade across the military borders, so Bottleneck became a hotbed of smugglers who had to traverse the mountain trails and the misty Rhine to provide for all the country's needs. At one point, the Freestaters even had to hijack a French coal train in order to heat their houses. Sadly, it all came to an end in 1923 following the French's occupation of the Rhur. Following that, the Freestate was incorporated into the Weimar Republic. 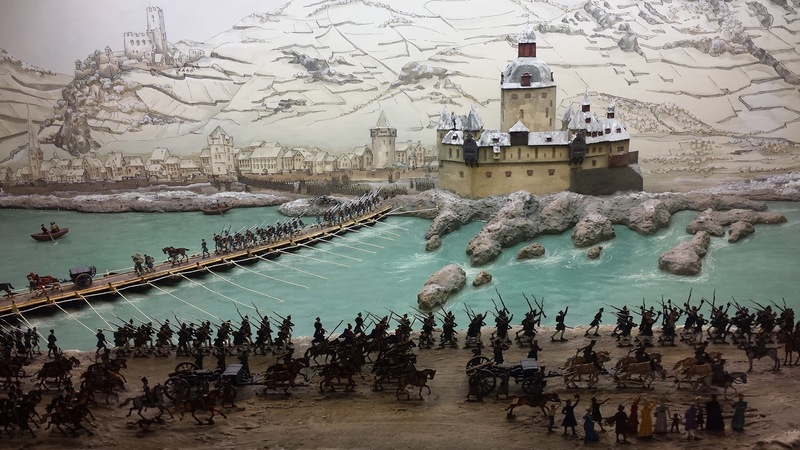 The last thing that really struck me on my trip wargame-wise was the role of miniatures and dioramas in bringing history alive. In several of the castles and museums I visited, the curators created gorgeous models to open a window into the past. At the top of this post is a picture from the Blucher Museum in Kaub -- it's a diorama using hundreds of flattened lead miniatures to depict Field Marshal Blucher's surprise crossing of the Rhine in 1813 during the Napoleonic Wars. Seeing these magnificent works gives me the ambition that someday I can model something with lasting educational value for a museum or exhibition or something like that. I suppose its not so crazy an aspiration - some friends I met at Hot Lead created a 28mm demonstration game of the Battle of Ridgeway (1866) for public display. Indeed, I got to play on their set-up a few months ago, and it was thrilling. Well, back to the Rhine. It was a wonderful trip with wonderful friends. But I have two pieces of advice for anyone who wants to hike the Rhein Steig trail between Mainz and Koblenz. First, enjoy the wine! 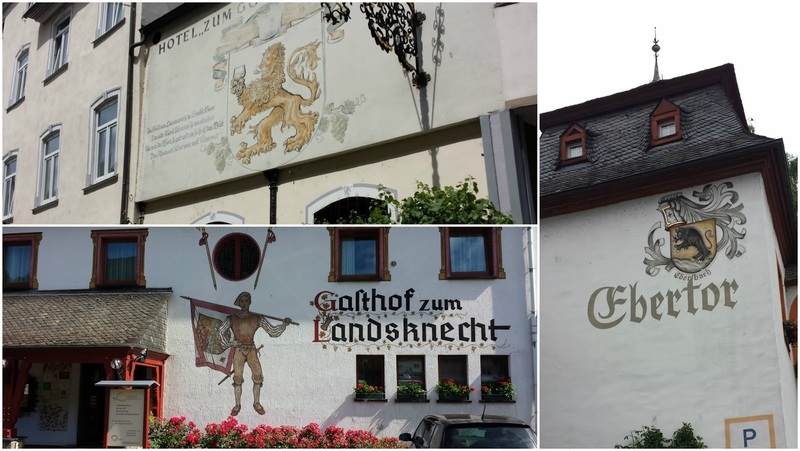 It is so easy to find 20, 30 or even 40 year old Riesling in the towns along the Rhine, and the bottles are not expensive. For a lover of mature wines, it's paradise. Second, do not eat the regional dish, Handkäse ("hand cheese"). Just. Don't. I hope to get to Poland someday, and when I do, I will certainly let you know, Michal! I'd love to see your beautiful minis with my own eyes. Looks like an awesome time! 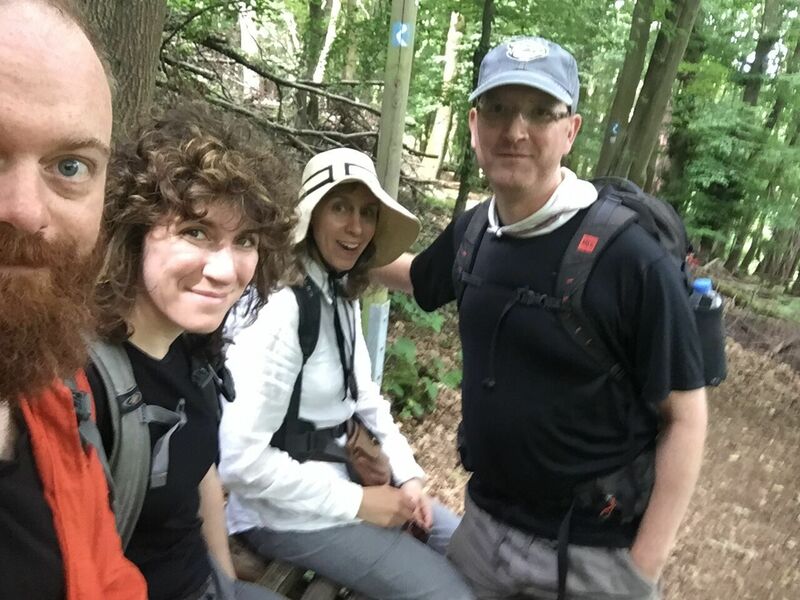 Totes jelly though....I miss walking those German woodland trails. Some of the best kept walking trails I've ever seen. I completely agree -- the trails in Germany were beautifully maintained and easy to follow. We only got lost once! A nice post Matthew, really interesting. Yes - it's very true... I always find myself looking at new places with my hobby goggles. Happily, my friends (and especially Mrs. Oldenhammer-in-Toronto) is very tolerant of this habit. Great looking trip. Hiking and wargaming inspiration, I'm jealous. The two great tastes that go together! Really interesting read. I haven't visited that part of Germany, I'm more familiar with Bavaria and all that area, which I can only recommend too. Haha, I didn't know of the Bottleneck State, it makes a great story! 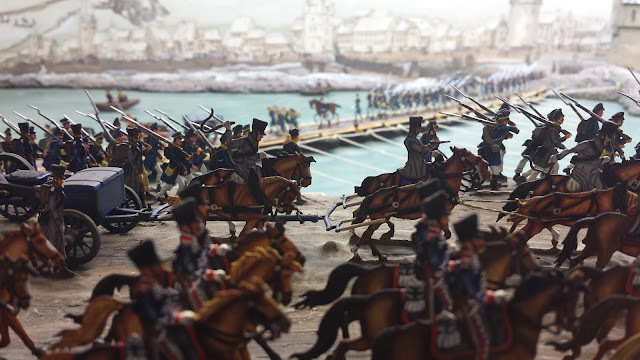 Travelling is always a great source of inspiration for everything, and wargaming is not an exception to the rule. Glad to read you enjoyed! I've heard that Bavaria is gorgeous and I would very much like to go. Hand cheese...What possessed you? Seriously, it looks like an inspiring trip - in my youth I always wanted to take a cruise down the Rhine. I've got the Mordheim game on my iPad, but not played it yet. I have been entranced by 'Deathwatch: Tyranid Invasion'. By the way, the same company that created Mordheim is apparently working on an implementation of Necromunda. Should be interesting. just say a word. thats where i live since 35 years. 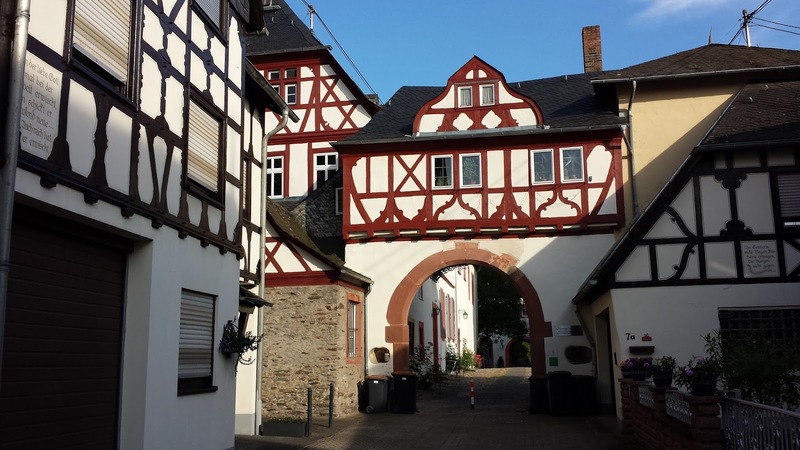 have you been in koblenz? Yes, we were in Koblenz for one night. It is a beautiful town. I wish I could have spent more time there. Great stuff- love the castle model! How long was the hike? 10 days of hiking. Not too rigorous hiking - we would often have a boozy lunch and then take it easy in the afternoon. "It even smelled like a castle: a yeasty mix of old leather and damp wood, not unlike the barrel cellar beneath a winery." Sounds like a great trip, and yes, it's ALL TRUE. My parents' old photos of Germany look like a parody of a 70's tourist brochure for Germany. Buildings older than my country! Knechts! Dirndls! Stadt parks! 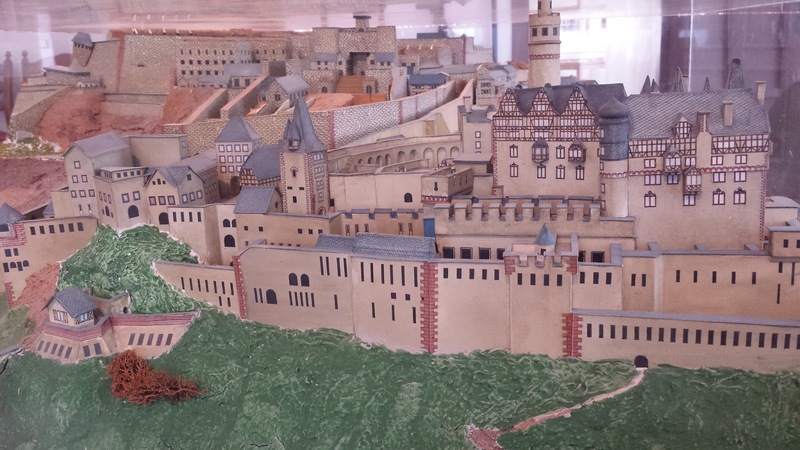 It is a worthy and fun debate -- what would castles really have smelled like? I suspect that hygiene was better seen to in the German castles than it was in their English equivalents. I noticed many well-designed shitters in the German castles I visited. "And the wall art was magnificent, and will provide a lot of inspiration when I eventually start to model my own scenery..." Can't wait for this! My favourite picture is the one of the kitchen! Rhine Valley added to bucket list. That kitchen was gorgeous. It reminded me of something from Skyrim. Wow, very impressive, love the castle! Beautiful pics though of an area that looks completely untouched for a long time. I wonder if it suffered at the hands of the Allied advance during WW2? Looks to have been a spectacular trip. Travelling is such a treat. We're off to Berlin this autumn and are very much looking forward to it. As you say, the region gives GW fans a great appreciation of the 'Old Worlde'.